Social media is growing uncontrollably. In fact, 2.8 billion people were using social media by the end of 2016, up 21 percent from 2015. That’s not all. Brands are also realizing the beauty of social media, however, with a slightly different approach. There are 40 million active small business pages in Facebook and 4 million of those businesses pay for social media advertising on Facebook. This just shows how big of a part of the businesses who are using social media in marketing purposes knows the importance of using it as a marketing tool. If you are one of those who belive social media marketing is just a trend that will die out soon and refuse to put thought into it, then you’re missing out on some huge potential. In this article, I’ll be breaking down the Top 8 Reasons You Can’t Afford To Ignore Social Media Marketing. A large part of what social media is able to generate for you marketing wise is completely free! Choosing to stay with the free methods of reaching your target audience is fine in the beginning while you’re learning how to effectively reach and target your audience, but putting a budget aside for social media can really do wonders long-term. Flyers, magazine, newspaper or other form of display ads is the marketing of yesterday. However, there is still brands using it. Even though it is fairly pricey, based on the fact that you have no idea who sees your ad, or any possibility of analyzing the results. Putting money aside for a social media marketing budget is recommended. Using ads on social media offers extremely targeted ads that are affordable for most businesses as well, and compared to display ads, the ROI and results of social media marketing just makes display ads look silly because only then, you’ll realize really how expensive they are compared to what they’re generating. There is no other source of marketing that can help you reach as many people as you can on social media. Depending on if you’re using paid social media advertising or solely using your own following base, you can reach up to hundreds of thousands of people within an hour when using the right tactics. Try handing out several hundred thousand flyers in one hour and get everyone to read your message. It will be though, right? So, with just $20 per day, and with the criteria I chose, my ad would have been able to generate 7,500-24,000 reach and 64-310 website clicks. Not bad at all. Certainly not if you can convert just one of those who visit your website. Depending on your product, one person might have been able to finance that whole day of Facebook ad costs. You can increase your website traffic tremendously with a good social media marketing strategy and some effective marketing, without having to pay a single dollar for ads. These are results you can achieve all by your own with a little bit of knowledge and consistency. If you on the other hand are paying for marketing, I’m guessing your goal is increasing sales, and here’s where many marketers have a wrong mindset and approach. What is important to realize is that the results of a marketing campaign, paid or non-paid can come several months or even years after the marketing effort is done. And that’s thanks to brand awareness. With any sort of marketing, and especially social media marketing, you increase brand awareness. This can be the deciding factor whether someone buys something from you or not. A while ago, I watched a YouTube where people were broiling. On the meat, they added “Sweet Baby Ray’s” barbeque sauce. When I saw the sauce, I didn’t know what the brand was and i had never heard of it before. After the video ended, I carried on, putting zero thought into “Sweet Baby Ray’s”, but suddenly, I was in the store and saw it – Sweet Baby Ray’s barbecue sauce among many other competitors. But which do you think I chose? Unconsciously, it had been burnt into my brain and just thanks to a single appearance on a YouTube video, I bought it, and have bought 5 new bottles after that. The same principle as the sauce goes for your social media marketing efforts. While you should analyze your social media results, it’s important that you are aware of a grey zone, that won’t show instantly after a marketing campaign – even if it was thanks to the campaign it was generated. Do you think the sauce will believe that is was thanks to that YouTube video that their sales has increased with 6 bottles? Probably not, but it shows how powerful brand awareness is, and that you should put a lot of effort into building it. While customer service isn’t seen as marketing by many, it is. That’s because responding to customers in a great manner also shows everyone else who sees your response that you are a company with great customer service. How you treat your customers can be the deciding factor if a customer returns or not. It can also be the deciding factor whether that person recommends your brand or throws dirt at it. In fact, a study by getambassador found that 71% of consumers who have had a good social media service experience with a brand are likely to recommend it to others. Therefore, it’s important that you use social media as an effective customer service tool in order to increase brand engagement and draw new customers. The best customer are the returning ones and the second best customers are the customers who got a recommendation from their peers. We’re seeing a trend on social media that brands are taking a large part of their customer service there. There are several reasons to this. Firstly, customers are expecting fast responses. 32% of social media users who write to a brand expect a response within 30 minutes, and 42% expect a response within 60 minutes. That’s why it’s important for you to be there and answer their complaints or questions. While email is good, it normally makes things take a bit longer. That’s where social media comes in. In just a few seconds, you can respond to the customer. A surprisingly quick response to a customer can really change their whole perception of your brand, and ultimately make them recommend it to others. The beautiful thing with taking customer service to social media is that your messages are often public for the world to see. Since anyone can see how you are responding to customer complaints, questions or requests, it is a golden opportunity for you to shine in front of potential customers. When it comes to customer complaints, there are a lot of brands who delete them on social media just because they don’t want other people to see them. This is just pouring gasoline on the fire. With the right method, complaints and angry or upset customers can easily be calmed down. By not responding – you’re responding. If you don’t respond, you’re sending ouy signals that you don’t care about your customers. People are watching how your brand deals with complaints and this can have a huge affect on whether or not they believe they can trust you. It’s an opportunity for you to show how good you are. Negative complaint don’t have to be something negative. By treating the angry customer the right way, you can quickly turn them into a happy customer again. A study by The Social Lifecycle found that customers are expecting a lot from the when it comes to being active on social media. 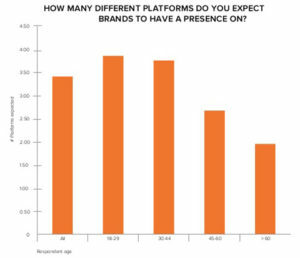 The study found that consumers expect brands to be active on at least three social media platforms. There’s not really much to say here other than that the numbers talks for themselves. Customers expect you to be on social media, and being so can create valuable relationships, increase brand awareness and ultimately increase sales, so if you aren’t active on social media – now is the time. Thanks to the huge freedom you have on social media, it makes for a very targeted marketing. No matter if you’re paying for ads or not. If you are leaning towards ads, you can laser target those you are targeting with your ad and in that way get an extremely high ROI. As the demand by brands for the ability to run targeted ads has dramatically increased, the possibility of doing so has been made possible. Social media platforms such as Facebook, Instagram, Snapchat and Twitter all offer very narrow criteria for who gets to see your ads, if you wish. Just look at all those criteria you can use to make for a very, very targeted ad campaign. Select gender, languages, platforms and carriers. Here’s when the real targeting begins. In this section, you can really personalize your ad. Add keywords, follower amount, interests, tailored audiences, TV targeting, behaviours and event targeting. Choose a single location or several location. The more precise you are, the more targeted campaign you’ll run. Almost no matter who your target audience is, they can be found on social media. The most important part here is knowing where they are to be found, as not all social media platforms have the same demographics. As a business, you want to be where your customers are. One obvious benefit of that is that you’ll always be on their mind if you are. However, for potential customers that you haven’t caught in your net yet, it’s about getting them to realize that you actually exists. The key to that is engaging with your audience.By engaging with your audience, you’re also building up authority as you show yourself experienced and well-educated in your niche. The great thing with having authority is that if someone from your audience has a concern or question, the first person to ask will of course be you, as you have portrayed yourself as an authority and go-to source for knowledge and information. Getting your customers who have had a great experience with your brand to share something about you on social media is priceless. That’s because people are more likely to trust their peers than a brand. Therefore, getting your customers to do your marketing on social media for you can be extremely valuable, as it will be easier for you to build up trust quickly. This type of marketing is difficult to get anywhere else, and as a brands with high authority can influence its followers simply by asking for shares , social media is more powerful in this area than anything else. Social media is a really valuable tool, suitable for many different areas, building brand awareness as well as driving sales and website traffic. As statistics have shown that consumers expect brands to be active on at least 3 social media platforms, it is important that you meet their wishes and expectations, if you aren’t already. Try running social media ads and run very targeted such to see if they are something for you and your brand. If executed correctly, they can generate beautiful results.